So the other day, I was in the city and decided to meet Pale Ale Guy for a drink. Unfamiliar to the particular section of the city, I used an IPhone application to pick the bar closest to where I was going to be and lo and behold it spit out The Mission, in Mission Hill, a neighborhood of Boston. The bar is very non-descript on the outside and was sparsely filled when I arrived on a late, lazy weekend afternoon. Pale Ale Guy was already waiting at the bar and we had our pick of seats. I picked a seat with no taps in front of it and sat down to look at the beer menu. Immediately I was surprised. They had a beer selection of over 80 beers broken out by style, a very impressive list for a place that is pretty small to be carrying such a supply of bottled and draught beers. I went with a Flashback Brown from Boulder Brewing and sat back to enjoy. As I mentioned, the bar wasn’t overly crowded, but I’d have to say the bar service was top notch. The bartender was knowledgeable on all beers served, was able to make suggestions based on my whims for the afternoon, and allowed me some small samples of the draught beers I was thinking about ordering, as well as some samples of things the staff thought I might like. When you have bartenders like this, it makes for an easy afternoon and you can really put down the beer list and let the bartender take care of you. Since moving to Boston, I have found these kinds of interactions with bartenders rare. Typically you have to build a longstanding relationship with a bartender to earn the perks Pale Ale Guy and I were getting, but I have found that in beer bars you are more likely to have these situations, especially if you are willing to take risks, speak somewhat intelligently about beer, and not order some mass market popular beer. My only negative thoughts about The Mission are, I wish they would list Brewer, ABV and size of beer on their beer menu and the fact our bartender ended their shift without closing out with us and receiving the benefit of our appreciation. Of course once the bartender closed out so did we, as we enforced Vegas rules, when you’re on a hot streak with a dealer, you close out when they do. In summation, if you are in Boston and looking for a good beer bar, I would definitely suggest you swing by The Mission. They have trivia Sunday nights and seem to be quite busy on weekend nights. The food was good and if I were to rate my experience on the beer scale I'd give it easily a 4.5. 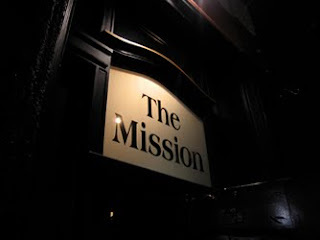 It's been awhile since we've done a beer bar review, and we should do more of them, but after our experience at The Mission and the fact Eileen posted on Monday giving me a good excuse to skip my posting duties for Monday, I thought I'd contribute a bar review.